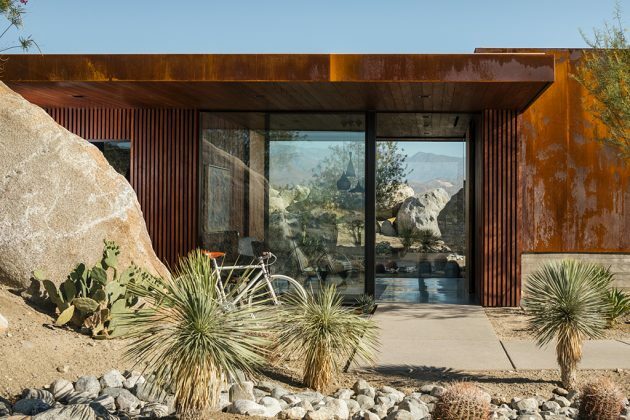 Studio AR&D Architects have designed a beautiful, weathered steel-clad guardhouse for a new residential development on the hills overlooking Palm Springs, California. 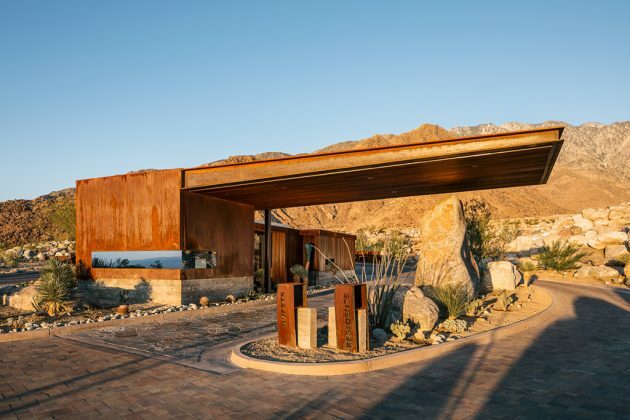 The Desert Palisades Guardhouse is a 915 square foot building placed in a natural setting. 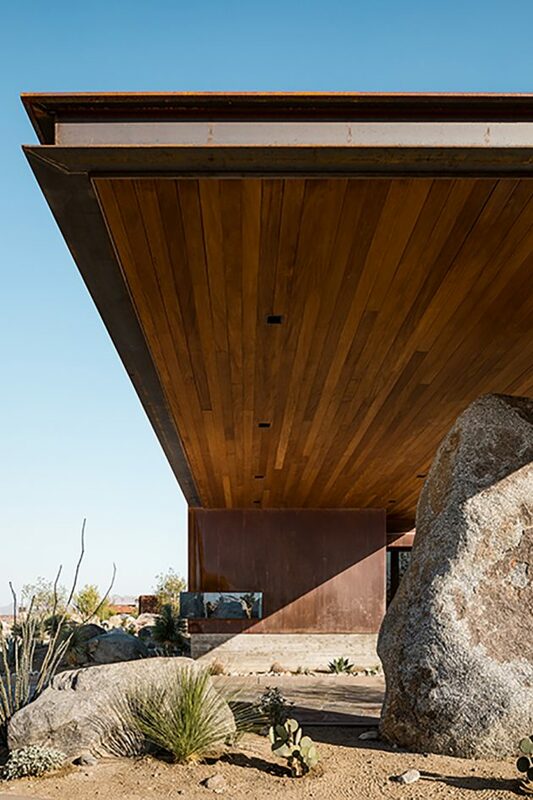 The rocky surroundings provided the primary inspiration for the design. 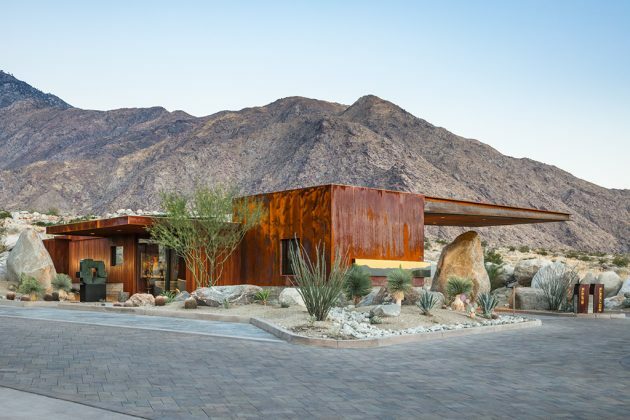 At first sight, the guardhouse almost blends in with the rugged landscape that surrounds it but as you move closer you can notice its modern and industrial look. 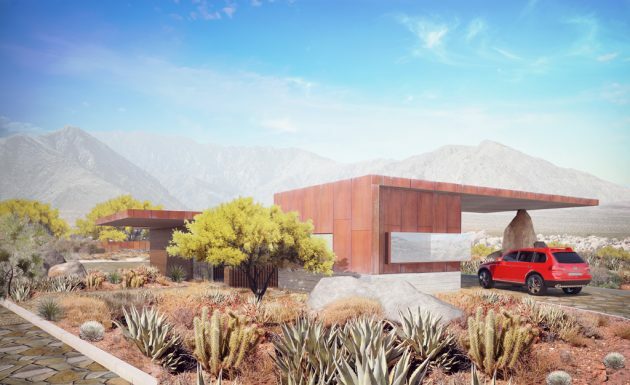 The guard house was originally conceptualized as a gateway to this long awaited residential development, located on the elevated hillside overlooking Palm Springs. 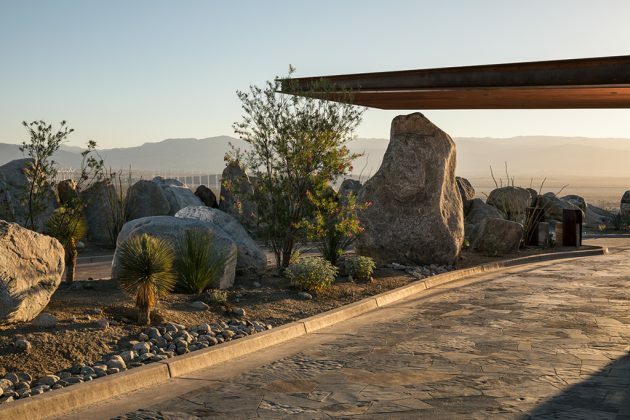 Upon initial visits to this captivating site, and witnessing the expansive views and natural setting, It was evident that this building should reflect the caliber of the homes intended to be built here, while complimenting the raw and rugged terrain. 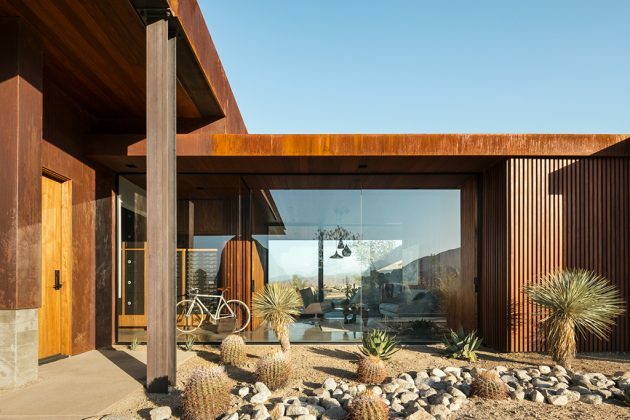 The materials chosen were selected for their durability, timelessness, and their compliment to the desert environment. 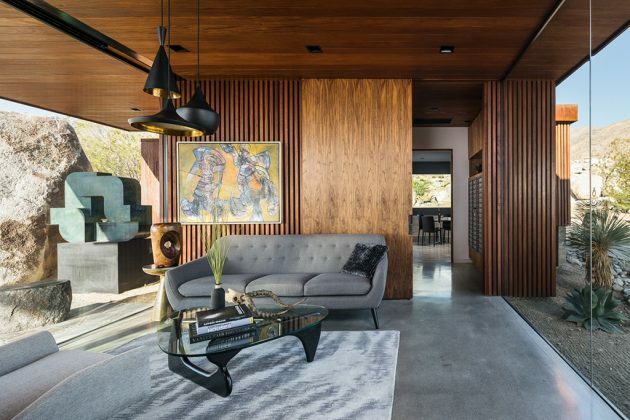 The aesthetic was designed to reflect both the nature and thrusting of the hillside slope. We really wanted this boulder to appear that it was very close to the roof but not quite connecting to it physically. Instead we preferred the tension created between the two structures, natural and man-made, and wanted them to speak to the other while still remaining elusive of one another. The exact distance between the two wasn’t as important as the energy between the two. 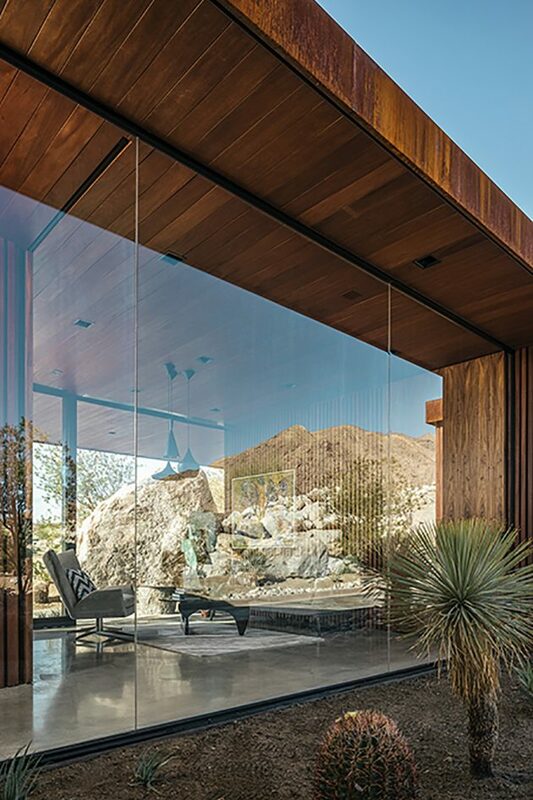 The exaggerated length of the cantilever that gently shades the large boulder was important for reinforcing the tension created between the natural and man-made. 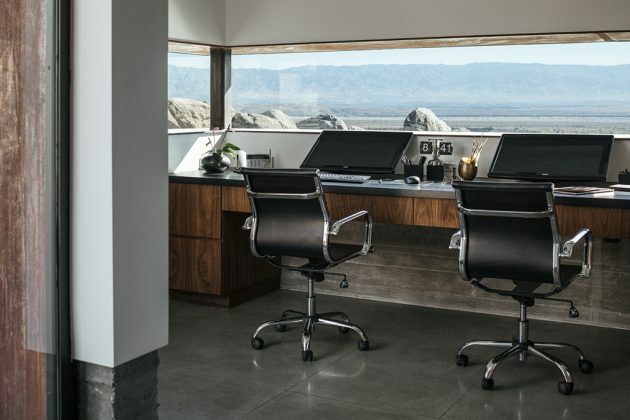 The conversation that the 2 elements have with one another could only have been achieved so poetically by taking the largest boulder on site and marrying it to a structure that stretches the limits of engineering to its maximum potential. 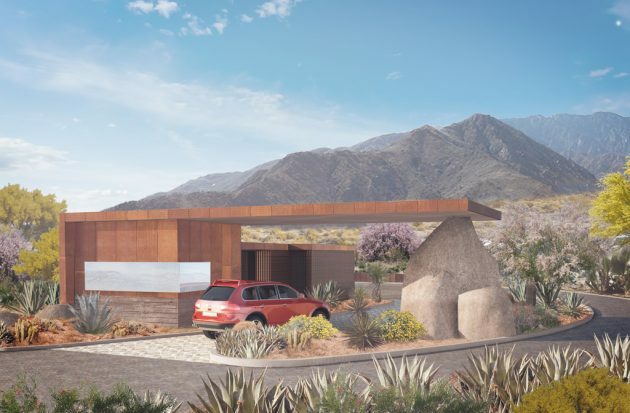 Our vision that we intend to create throughout this project would be to create this same conversation, connection, and tension between the built and natural environments. 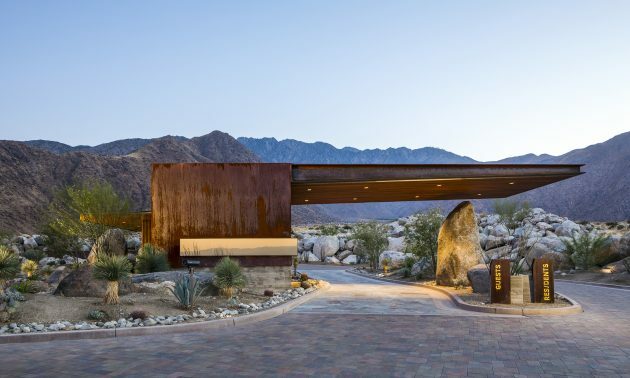 Materials used: In order to push the limits of the engineering for this gatehouse, steel and concrete were chosen for their strength and ability to resist an extreme amount of tension and compression. 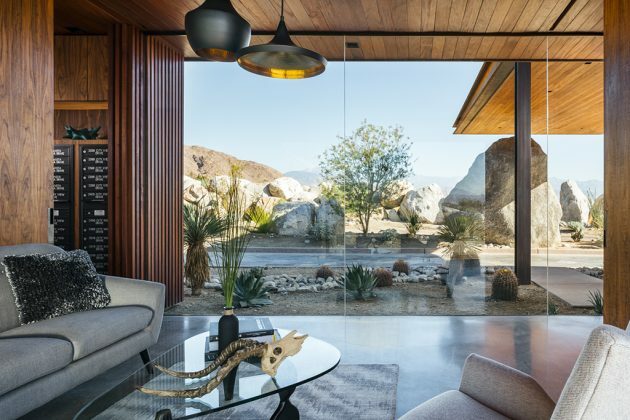 The treatment of these materials, and in an effort to compliment the natural surroundings found throughout the Desert Palisades project, dictated that we present these materials in their truest form. It was paramount that the materials of the outer shell and structure be left to patina naturally, unadorned with any added finish. 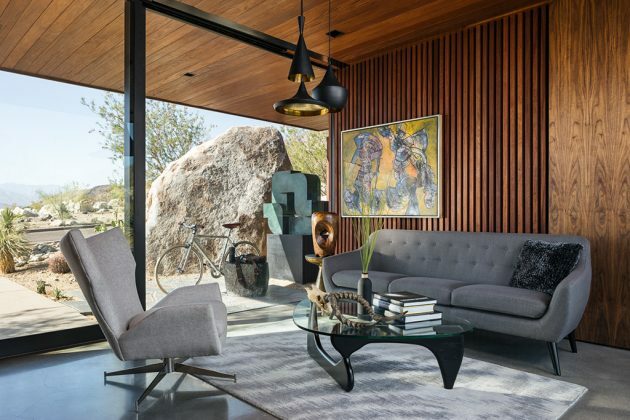 The interior materials, in contrast, were intended to communicate a dichotomy between the built and natural elements. These read as a much more polished and refined aesthetic, while still providing a warmth and strong connection to the surrounding landscape.